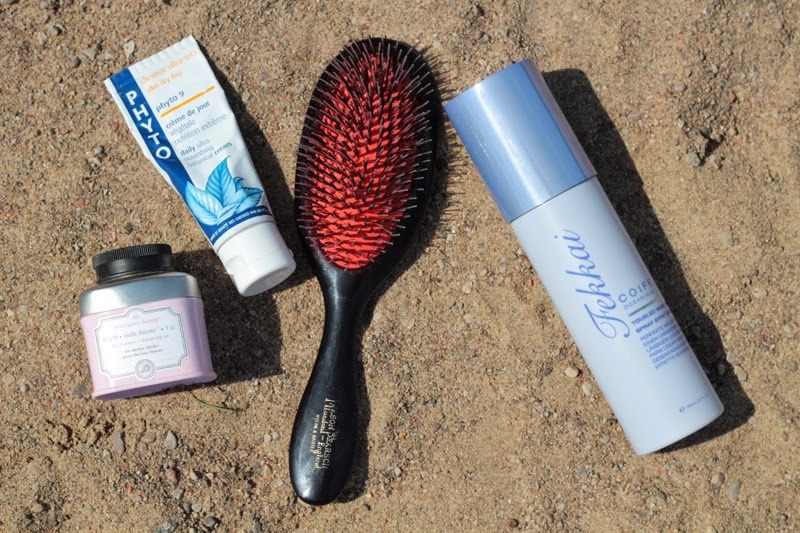 It's officially Summer next week, so I thought I would share some of my essentials this season with you. Now, you'll notice that a lot of these could be classified as "all year round" products for me... What can I say? I am a creature of habit. I'm always all about the lightweight, barely there makeup, but in the summer, I love to add the extra SPF, the extra glow, and the extra oil-control. No matter the season, I love to exfoliate with the Clinique 7 Day Scrub Cream. It buffs off the dead skin cells to keep your skin glowing. Oil-control serums are where it's at for me right now and my favourite at the moment are both from the Bioderma Sébium line: AKN and the Pore Refiner (not pictured). This range just works great with my skin to keep the oiliness at bay. Adoring the Clarins Beauty Flash Balm. I don't use it every single day, but I always bring it out when my skin needs a little pick-me-up -- either when it's looking tired or a little dry from the sun. You'll always find some sort of water mist in my bag, too. Currently, I'm rotating between travel sizes of the Vichy Thermal Spa Water Spray and the Evian Mineral Water Spray. The mist is cooling & hydrating -- perfect for overheated or dry skin. Then there's the makeup setting sprays. At the moment, I've been loving the Urban Decay De-Slick. It keeps your makeup on all day & impedes the unflattering shine. Above all else, like foundations and alphabet creams (i.e., BB, CC, and DD creams), tinted moisturizers are my favourite. The one I've reached for the most has been the Chantecaille Just Skin (in shade Wheat). I certainly don't think it's the best tinted moisturizer out there (and for the price point, that goodness for that) but my skin likes it. I actually ended up repurchasing it (even though I said I didn't think it was worth it) because I missed having it. 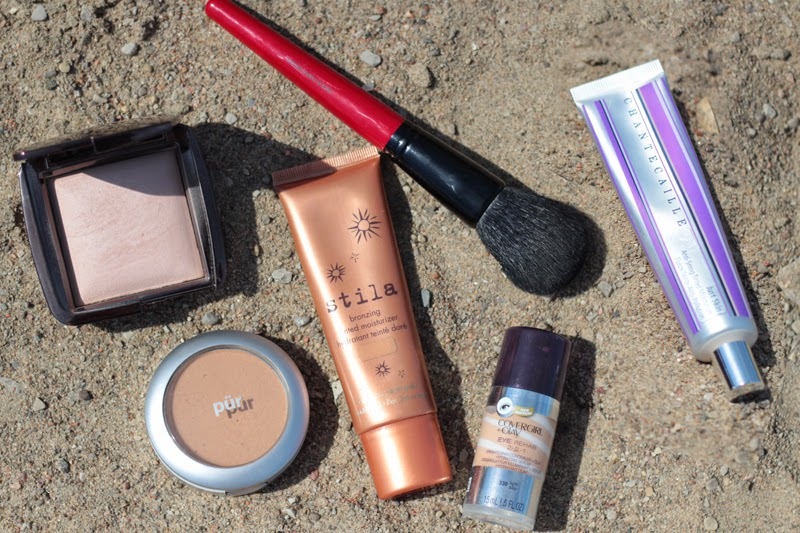 I also love the Stila Bronzing Tinted Moisturizer. It offers you just enough colour for a radiant sun-kissed glow. I think this may be on the verge of being discontinued because I haven't seen it in stores for several seasons. A great alternative is the revamped Revlon Skinlights in Bronze Light. As for finishing powders, the Hourglass Ambient Lighting Powder in Dim Light has been my go-to. I'm not one for full-coverage concealers, so the new Covergirl + Olay Eye Rehab is the one I've been reaching for. It's lightweight, hydrating and brightening. Now, if I want something with a little more coverage, I reach for a powder foundation, like the PUR Minerals 4-in-1 Pressed Mineral Makeup in Light Tan / Tan. Powder foundations are terrific in the summer. It's fairly foolproof because it blends so easily. Plus, since it's your foundation, concealer, finishing powder, and SPF in one product, it's perfect if you're in a rush. Aside from shampoo & conditioner, which I tend to switch up every few weeks, I like to keep the hair products minimal. Dry Shampoo is key. It keeps your hair looking fresh throughout the day (and the next day). I like the Principessa Dry Shampoo because they have one specifically for darker hair. 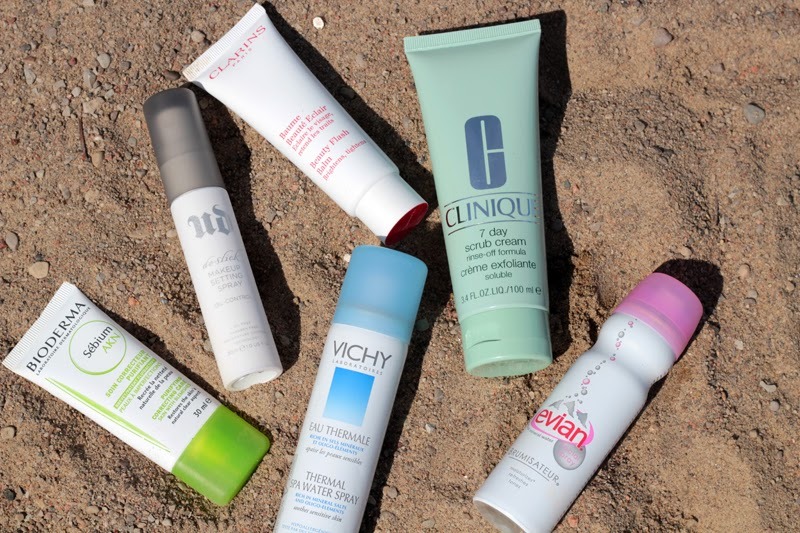 I keep a hydrating leave-in cream, like the Phyto 9, on hand because the sun & chlorine can be quite drying. Now that I have shorter hair, this next one really isn't a major necessity anymore, but I still like a good beach spray. I'm currently using the Fekkai Tousled Wave spray to help bring out the slight wave to my hair. The Banana Boat Ultra Defense Sunscreen lotion is so hydrating on the skin, I almost forget it's a sunscreen. It's my favourite body SPF at the moment. 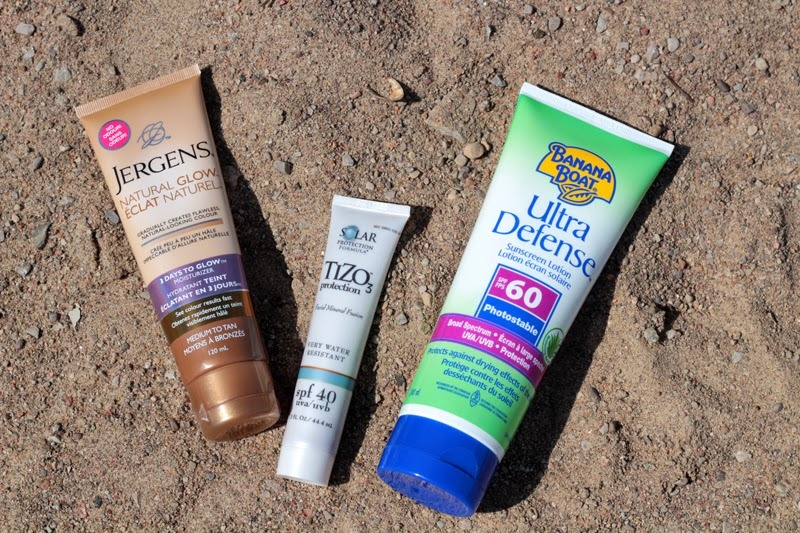 For the face, I've been loving the TiZO3 Tinted Sunscreen. I love the silicone-based texture. It doesn't clog my pores, it doesn't look shiny on my skin, and it's supposed to last all day (depending on your activity). I love a little extra bit of colour, but I hate bathing in the sun for long periods of time. That's where the Jergens Natural Glow comes in. It's the new unscented formula (there's still a slight fragrance, but nothing like its predecessor). A gradual tanner that feels a lot like a lotion but will turn your skin a natural shade or two darker. It's pretty foolproof --- and no orange! Deodorant is even more important during those hot summer days. 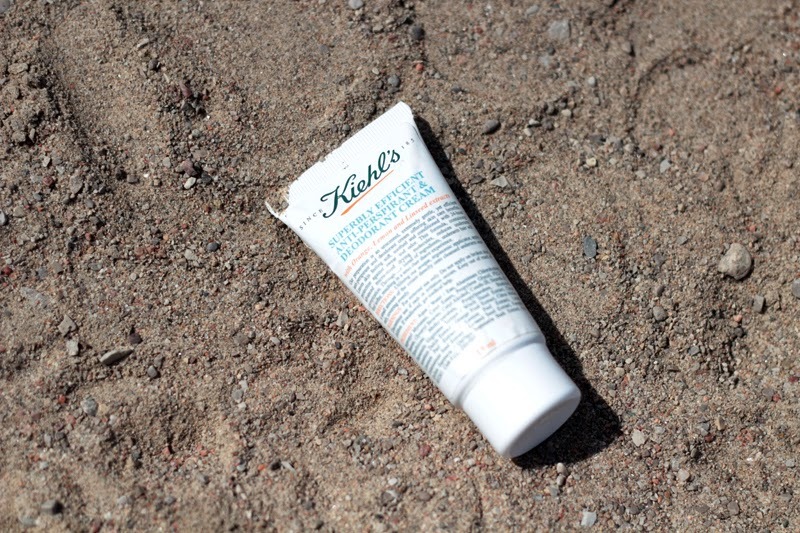 My favourite has always been the Kiehl's Superbly Efficient Anti-Perspirant & Deodorant Cream. Like the name suggests, it's a cream product, which I much prefer over the sticks, and it works great! I see Urban Decay changed their spray packaging! The new design is so much better and sleeker. Have you ever tired Skindinavia sprays? I know they manufacture UD's spray but I wonder if the products are the same. I don't like any of the normal deodorants. I only use the clinical strength ones Secret and Dove make great ones. They are the only ones that I think keep sweat and smell away! Stila still offers the bronzing tinted moisturizer but they rolled it into their BB cream line so it's now the Stay All Day HD 10-in-1 Bronzing Beauty balm (http://www.sephora.com/stay-all-day-10-in-one-hd-bronzing-beauty-balm-with-broad-spectrum-spf-30-P377340?skuId=1477256) and now it has an SPF 30! I've never heard of a cream deodorant before! I'm trying to stay away from products with aluminum in them though! Great post! I've been loving lightweight makeup too the past few weeks. Great products! I love the jergans and the evian water!